This is a first for this blog, and I am really excited to announce that after a four day tour at eight other blogs - including openbooknigeria.com and BooksLiveSA - today I host Nigerian author, Ifesinachi Okoli-Okpagu, on the last day of her week long tour. Okoli-Okpagu will be on hand to answer any questions you might have (just head over to the comments section) - I know I have tons! Before we get to that, a bit about the author and her novel, The Domestication of Munachi. Also copies of the book can be purchased at the Magunga bookstore for readers in different African countries. …Two sisters walk in on their father’s sexual liaison with the family’s hired help which leaves them both scarred in different ways. The three main themes that stand out are - One, the untoward pressure on young women to marry young regardless of their physical and psychological readiness. Two, physical abuse of women, especially married women and the society’s penchant to suddenly become blind to this until an irreversible damage is caused. Three, the deception of religion in our society today. There are, of course, other sub themes such as family, the relationship between mother and child, adultery, long distance marriage, and so on. Hmm… Despite Munachi’s eccentricities, I do love her. She could easily be my younger sister; the kind that can be so annoying. I think she would be my favourite. For some reason I also like Aunty Ngo. She featured on few occasions, but every appearance came with drama and a reveal of a slice of the life she is struggling so hard to manage. Then again I chuckled throughout writing her bits. Aside wishing she could travel more often and she could stop answering questions nobody ever asks, Ifesinachi is a creative mum with the superhuman abilities to get bored when she’s working on a single project at a time. The Domestication of Munachi is her first novel. In her regular life, Ifesinachi .O. 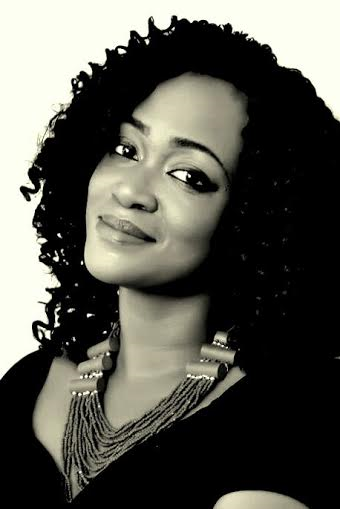 Okpagu is a Lagos-based marketing communications executive with over seven years’ experience, including being an Associate Producer of a pan-African TV show and heading the marketing communications team of an insurance company. She also serves as the chief custodian of the Lexiton brand with intellectual property in the media and entertainment industry. Her first book, a novella, was published when she was fourteen and was adopted as a secondary school recommended text in Delta and Ebonyi states. She has written/produced several screenplays for the big screen and for television. Now you know a bit about the author, and her debut novel - here's your chance to ask questions about the novel, her writing process, getting published and more. Can't wait!!! PS. There's a chance to win a copy of the book. Good luck!!! a Rafflecopter giveaway. Such a pleasure to have you here on bookshy today. 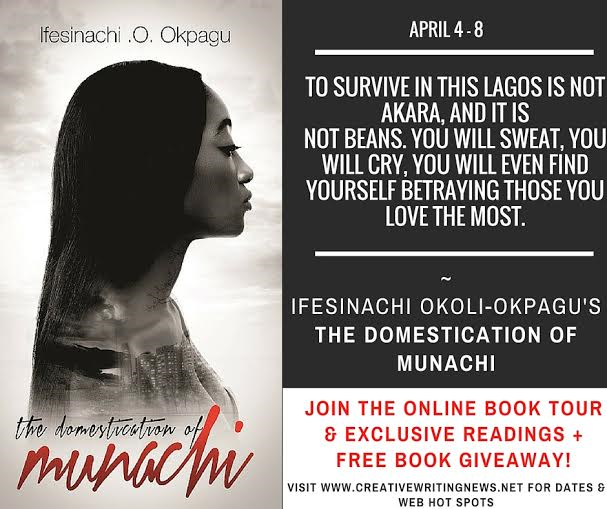 This is the final part of your week long tour and I'm looking forward to chatting with you about your debut novel 'The Domestication of Munachi', but I'll start by asking how you have found the tour? Thank you for hosting me. It has been exciting. I have been awed by the support and curiosity of readers and guests on the tour. I look forward to chatting with you today. Same here. I definitely have a lot of questions. And it must also be an exciting time for you though, with the launch of your debut novel. What has it been like having your first novel published? Challenging. Definitely. There was a long wait between when I turned in my final draft and getting the book out. But I think the headache melted away as soon as I held in my hands the hard copy novel! Speaking of the hard copy, which is why we are here. Reading your novel, I couldn't help but think, Munachi's experience in Lagos and living in her Aunt Chimuanya's house was like a guide to being a Lagos 'runs girl' and hopefully become a big Madam - with Chimuanya and her friends being her teachers. Could you speak about the lifestyle Chimuanya wants her niece to go into and why she felt that was Muna's only option? Chimuanya felt she was giving her niece the best of many options. She wanted her to be a kept woman; indirectly pushing her to depend on a man for her own freedom. But she failed to give her the other side of the story, especially her (Chimuanya's) story. Even though her Aunt had a specific idea for her niece, Munachi herself was quite brave - I was quite impressed about her decision to leave her hometown and travelling to Lagos in spite of the consequences of her decision. And actually, family burden and certain ways of being a woman are also themes you address in this novel. Could you talk about these? Oh yes, she was quite brave. Family burden is certainly an issue in most homes. Not just family, the society even. I once heard someone say that a woman he knew, who was not married at forty, was irresponsible. And I thought "what the ---?" The novel explores these themes. The stories of my characters are very real, as close to everyday life as possible. It is really interesting this whole idea of a marriageable age for women and when we supposedly reach our 'sell by date'. Do you think this idea is changing or is it still significant in Nigeria? Hello Ifesinachi, your book sounds interesting and I listened to the excerpts. I hope to be able to read it. What was the inspiration for writing a book of this nature about two generations of sisters? I was inspired by the cases and situations I witness, read about, hear about and experience. I am also the first of five children, four of which are girls; I have female friends, nieces and aunties, so some of the stories are very loosely drawn from our collective experiences as well. It's interesting you say you draw from the experiences of the different women in your lives as I was curious to know if there were also some personal experiences (either of yours or other individuals you know) that led to the creation of the four main female characters in the novel? When writing, Are you often worried that you might often family and friends when they can identify themselves in your story? Do family members ever say, this is a family secret, don't write about it. How do you manage these external pressures when writing? No. I'm never worried about that. People would hardly recognise themselves in my characters, except by some stroke of luck. They may recognise a line or two that sounds like what they would say, but never the complete picture, so no pressure on me. That must be great to be able to write without too much pressure when it came to the characters, but was there pressure in the writing or editing process of the book? Yes, there was. Pressure from my family (mum and husband especially lol), pressure from my publishers who were working with a deadline, pressure from close friends who kept asking when the book would be out, pressure from myself to deliver on my promise! That's a lot of pressure! So is there any advice you can give to upcoming writers (from your experience) about ways to manage the many pressures that could come with creating a novel? To be focused on the finishing line. There's no other way to getting results than through hard work and determination. There is no short cut! Thank you so much for stopping by Ifesinachi. It was an absolute pleasure.